Hand Rejuvenation in Upland has been conducted a lot to restore the youth of hands. Because the skin on the back of the hands is extremely thin, the loss of fat padding on any level shows quickly. Take away that cushion and all the structures in the hands show up. Radiesse addresses hand aging issues and instantly gives back the healthier, younger appearance of your hands. It is a dense, easy to mold filler with longevity of 12 to 24 months. Radiesse wears well in the hands and provides an instant cushion replacement, it is safe and effective. 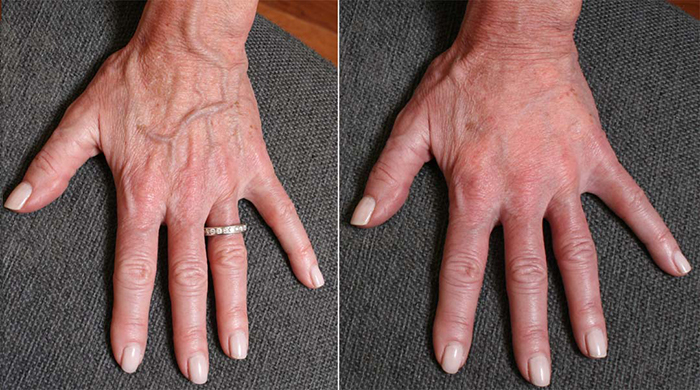 Hands naturally lose volume as we age; therefore, Hand Rejuvenation is the best solution for that. Radiesse® can be injected under the skin along the back of the hands to restore volume and lessen the visibility of veins and tendons. It also stimulates the body to produce its own collagen. 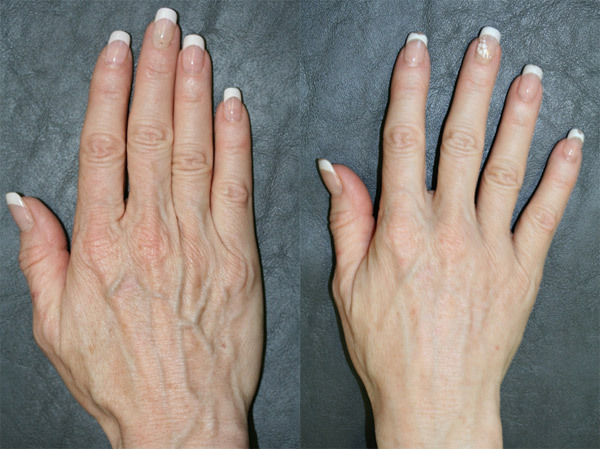 Most patients report an immediate improvement in the appearance of their hands that lasts up to 12 months! How does hand rejuvenation work? Radiesse® is a filler that is able to plump up the skin and subcutaneous space on the back of the hands and as an added bonus – promote collagen production. 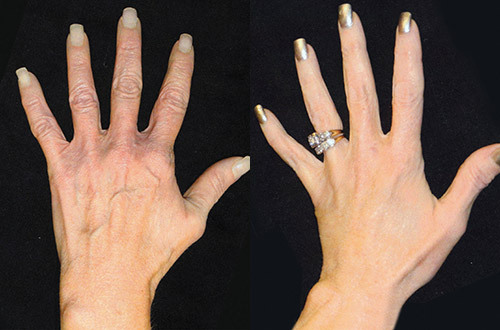 Thinning of the back of the hands reveals veins and edges of bones which can be a sign of aging. By thickening this area, the veins and bony appearance lessons as does the signs of aging. Dr. Sina will make sure to explain to his patients the process of Hand Rejuvenation in Upland. Most of our patients say that this procedure isn’t very painful. We do use a numbing injection and mix numbing medicine into the filler syringe of Radiesse®. I can usually do the procedure with one entry site – much like laparoscopic surgery. How soon will I see results of my hand rejuvenation, and how long will they last? You will see the results right away. At first there may be some mild swelling, but after about 7-10 days the slight swelling resolves. The side effects are minimal and mostly related to bruising, mild swelling, mild redness, and some mild dull ache for about a day or two afterwards. The active ingredients of Radiesse® are naturally occurring substances in the body. Thus, the risk of allergic reaction is very small. Who is Radiesse® treatment for? This treatment is for patients who are concerned about the thinning of the back of their hands due to aging.